A few weeks ago, I told you that I would be starting a series on color and using it in your food photography styling and composition. Well today is that day. To start off, I am going to begin with the simplest of color schemes, Monochromatic. Monochromatic sounds like a technical and complicated word, but really it just means using one base hue as your color scheme. I am keeping this simple, so think of a hue as red, blue, green, purple, orange, etc. What ever your solid base color is. In a monochromatic scheme, you take your base hue, and pair it with other shades, tones, and tints. Let me explain. In this example, our base hue is red. 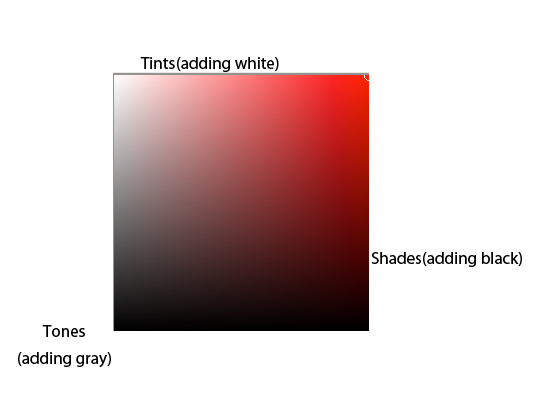 We can get different shades of red by adding black, and different tints by adding white. That isn’t all. When we add gray to the mix, we create new tones of our original red. 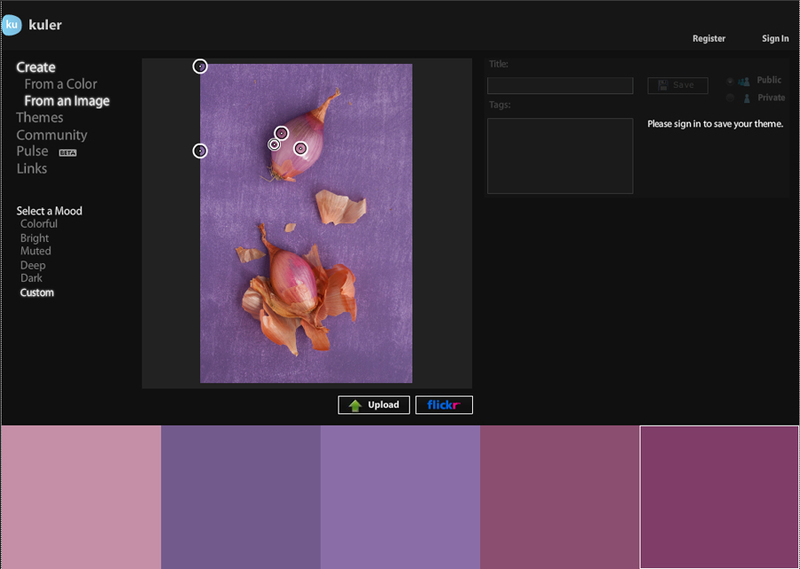 Even though we are using only one base hue in our color scheme, there are thousands of colors we can create from this. It might look great in theory, but you are probably asking yourself, what does this have to do with taking a picture of my food? Good question. For my first monochromatic color scheme, I am going to show the most basic of monochromatic schemes. White. White powdered doughnuts and a glass of milk. Clean, refreshing, light airy, these are all moods that this color scheme may provoke. Using Adobe Kuler ( I will explain much more about this amazing tool in a later post) we can break down the shades, tints and tones that are in the image. When you sample tiny points from all over the image, you can see that even this monochromatic image does have some variety in it. 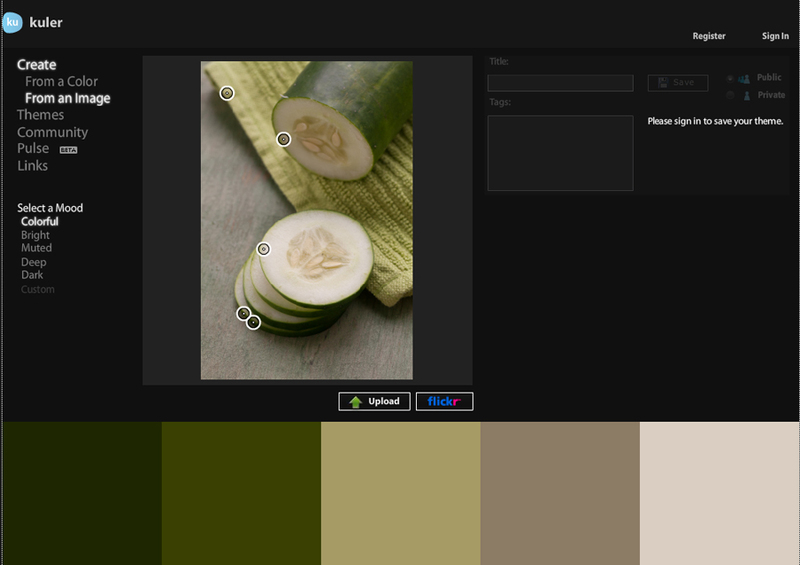 These 5 samples are what we would call the color palette of the image. They are a range of the colors in the image. The third and 4th sample squares have a slight amount greenish yellow in them, but I would still classify this image as being monochromatic. Do you notice anything different about this picture? When using only one color hue, the textures of your subject and your props are much more noticeable and play a larger roll in the picture. There aren’t any other colors to distract the eye, so you really notice the texture of the wax paper and the powdered sugar on the doughnut. 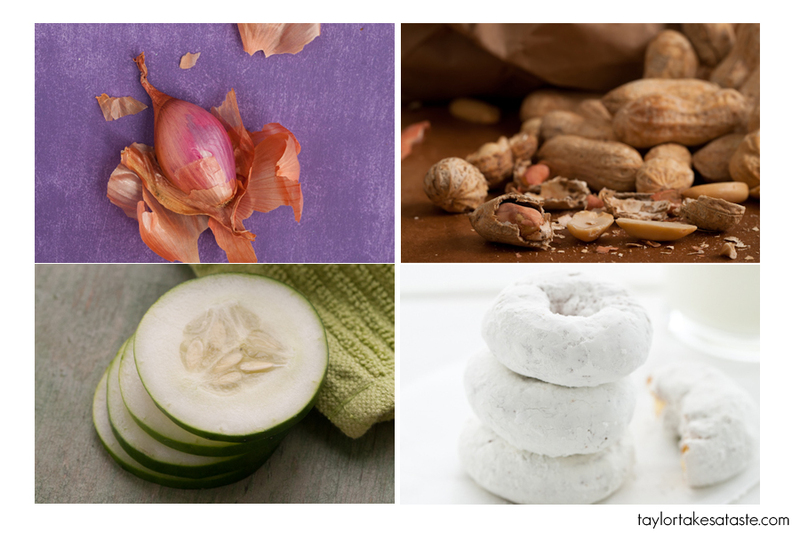 Other foods you could do a monochromatic color scheme with would be sugar, flour, cream, milk, certain cheeses, baking soda… You get the idea. Just pay attention to where your focus is and what you are focusing on. With everything being white, a blurry image is much more noticeable. Black and white is probably the first thing to come to mind when you think monochromatic, but it isn’t the only color this works with. For the next example, I went with brown as my base hue. Lets look closer at what specific shades, tones, and tints we have in this picture. 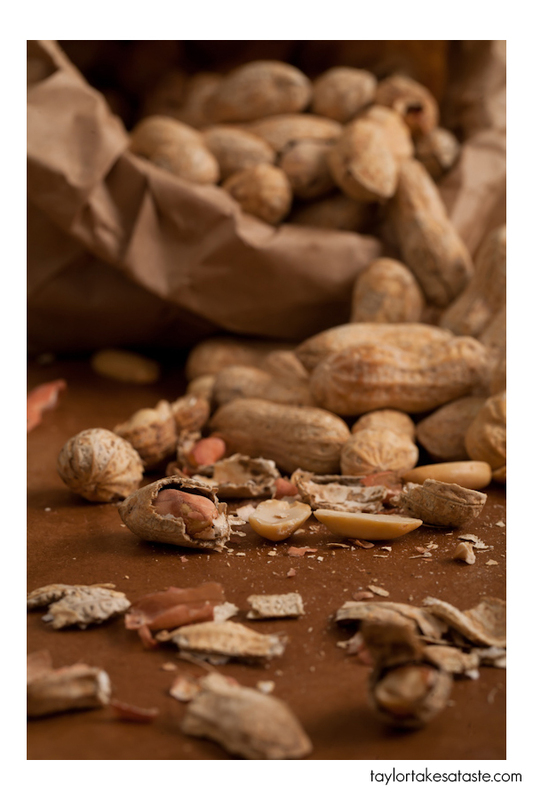 Between the paper bag, brown background, and peanuts, there are plenty of browns to choose from. When you first saw this image, you would probably wouldn’t categorize it as being monochromatic. Well it is. Sticking to a color palette that was full of variations on one specific hue, helps sets the mood for the image. 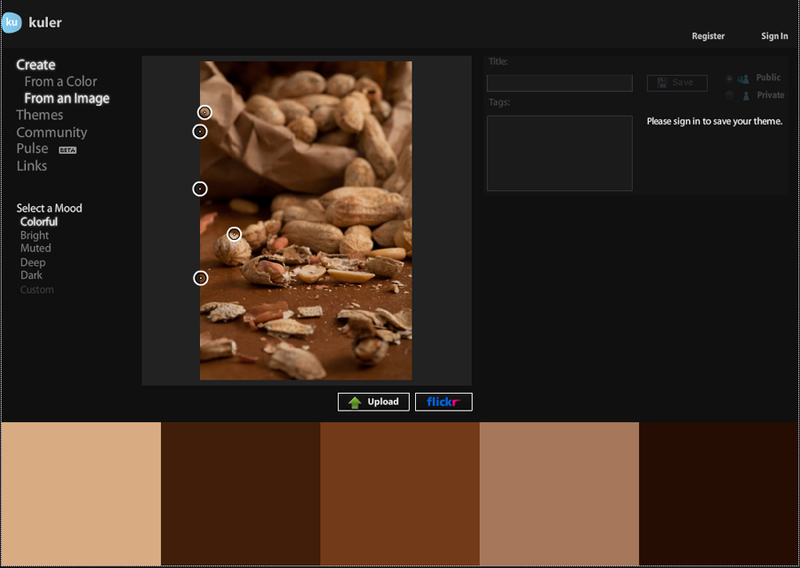 All these variations of brown, give an earthy, warm mood to the image.With a brown monochromatic color scheme, you could use a wide variety of breads, grains, nuts, chocolates as subjects. For the next example, I chose what I feel to be the most common color in food. Green. For this example I used a cucumber. Lets look closer at the specific greens. As you can see there is quite a range. This is a good example of using texture and layering to separate your subject from the background. When working in a monochromatic color palette there is the potential to “lose” the subject. 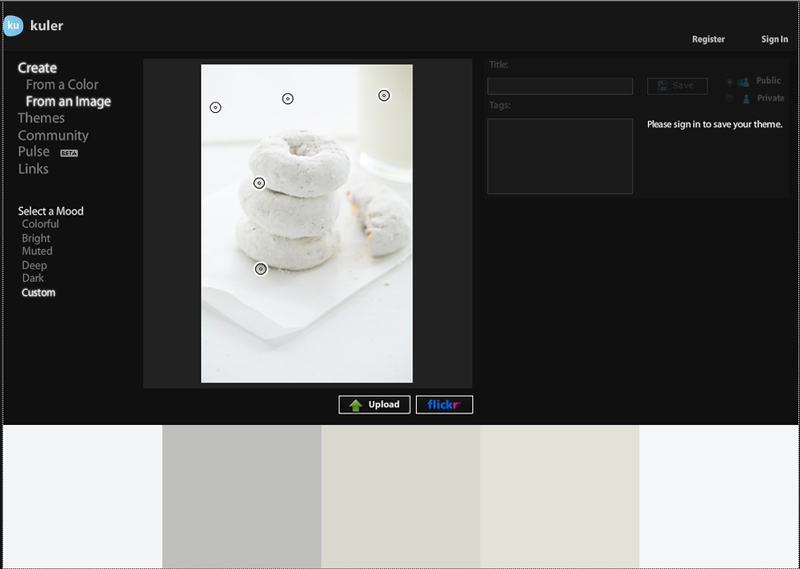 If you are using shades, tones, and tints of your base hue that are too similar, then you can lose the subject. It can just blend into the background. I had a different green board I was going to use, but it was too similar to the dark green cucumber skin. So I switched to a lighter green board. 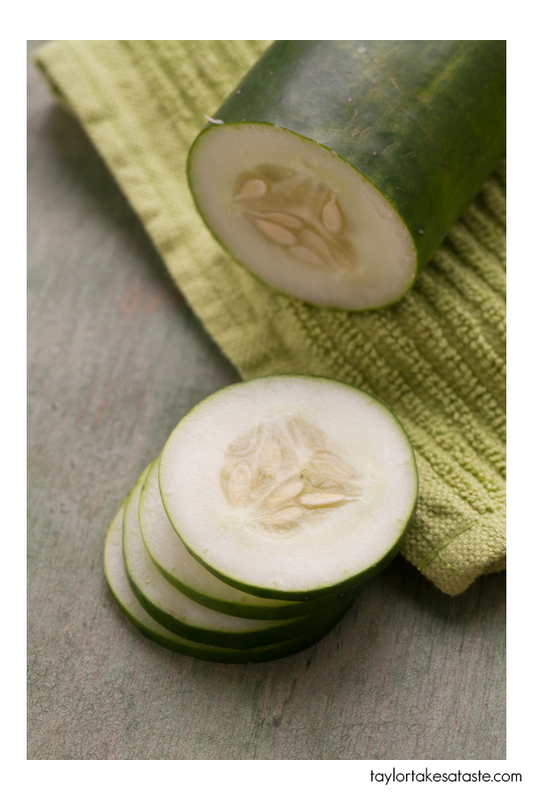 If I had peeled the skin off of the cucumber rounds, they could get lost in this lighter background. The dark green around them really helps them stand out and defines their shape. I also added texture with the green dish cloth. Remember you want your props to make sense. You use a dish cloth to wipe off a cucumber after you wash it, so it fits here. I omitted the cutting board and knife, because they were too far out of the green monochromatic color palette. For my last example, I have am using purple. Here, I am allowing mother nature to step in and add an accent color to our monochromatic scene. The brown wrappings of these shallots help separate the shallot from. They are part of the shallot, so in my mind they make sense. Lets look closer at the shades, tints, and tones. Between the background and the shallot there are a beautiful array of purples. -texture and layering are good things. They add interest and will separate your subject form blending into the background. – don’t worry if you have accent colors that are out of the color range. Just use what you think looks best. I hope that you have a new opinion and appreciation for monochromatic color schemes. Just because you are only using one color hue, it doesn’t have to be boring! What is you favorite color? Thanks Tami! so glad to hear that you enjoyed the post! Awesome writing and explaination.I love the airy look of doughnuts and the picture looks stunning.Getting ethereal whites is a big challenge for me.Loving all your food phototography posts..keep’em coming. Wow I am really impressed with that white on white shot of the doughnuts, that’s just awesome. I think white is one of the hardest to pull off monochromatically… Lovely photos and really helpful techniques – will definitely have to check out Kuler! Oh wow. This post is amazingly helpful. I said it last week, but you really have a knack for making this easy to follow and not so overwhelming. Maybe you should do a book! I agree with Kelly, you could totally do a book. You have a wonderful way of explaining it all and I actually understand it. Thanks. Thanks Milisa and Kelly. So glad that you found these tutorials easy to understand. I am currently working on a book. Not a food photography one, but a College Football Tailgating one. Thanks again for the comments. These photographs and explanations are wonderful! 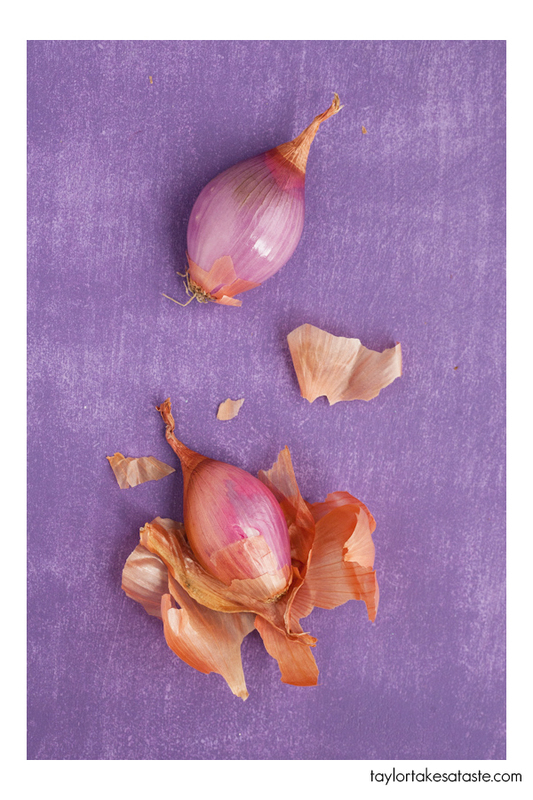 My favorite is the photo of the shallot. It takes it from simple vegetable into a work of art. I love the peels arranged around it. Gorgeous. I can’t wait to practice this! Thanks for posting this, it makes for really beautiful photo schemes! You do such beautiful work — and it’s so generous of you to share your process. Thank you. Taylor, as a new blogger and photographer I’m searching for whatever I can find to teach myself or by proxy of others. I have so much to learn and right now my new and first DSLR camera (Nikon D7000) are very much like an arranged marriage; we don’t really know each other or how to work together but hope in time and with work and patience will go to love each other and created beautiful things. Right now I’m still learning HOW to use my camera as much as HOW to take good photos. I found your blog purely by accident and I have to tell you I’ve been absorbing it like a sponge. I can not thank you enough for the help you provide and I would never have thought about the idea you present here. What a great but simple and impactful idea. Thank you Taylor so much!! Another great and helpful post. Thank you! Love the concept of using a single colour – going to try it out soon! Thanks for the post! I am constantly trying to learn new things to improve my photography skillz and this was very informative and helpful. Love your website and I visit it often! I love that last photo! I’m wondering if it pops more because the gold-brown of the shallot peels is almost the complement of the purples in the rest of the photo. Thanks for this series. I’ve been thinking about writing a similar one, but having found yours I think I’ll just follow along! …I forgot to say that these are AMAZING photos! This is awesome, very helpful. Thank you! That is totally gorgeous! 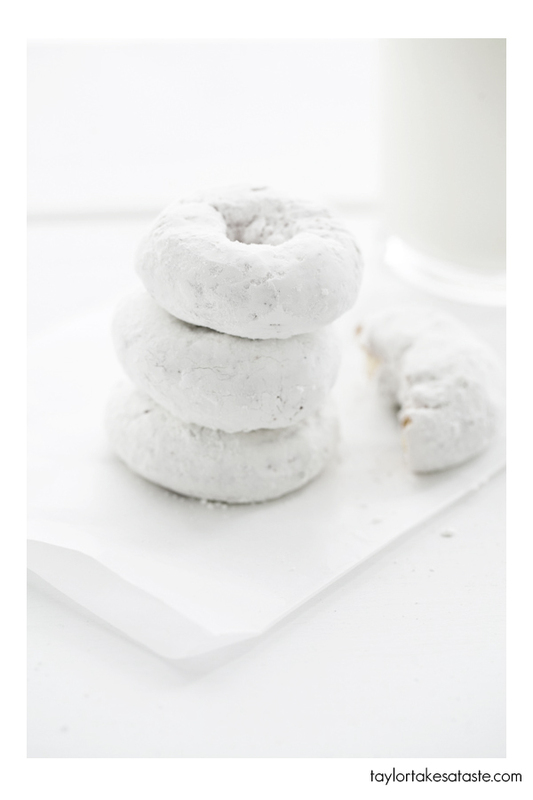 I am using your doughnut photo on my inspiration board for the white on white photography challenge… 😉 It’s beautiful! I’ll be buying your first issue of “Photographing Food” too!